In this download area you find a number of Move! publications or internal documents. You can download multiple documents simultaneously. The downloads are free of charge. Please make appropriate reference to Move! when you use them. Feel free to contact us for more information. Clement Leemans., (2017), Distributed Leadership : A powerful engine for Organizational Performance. Leadership Excellence Essentiels. In : www.hr.com. In this article Clement tries to identify the reasons why organizations need to think about shifting the 'control & command' culture and the idea that leadership is linked to people and positions. 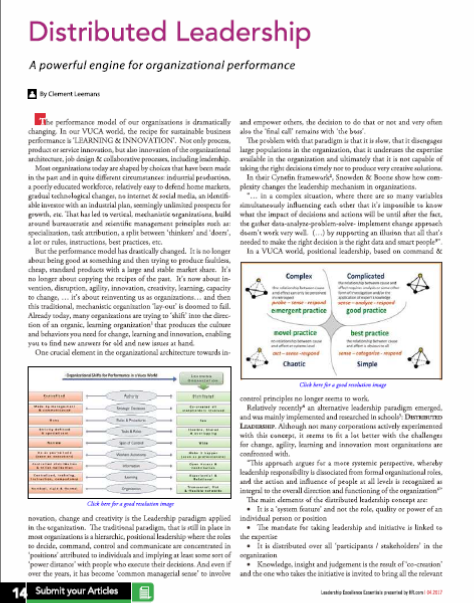 He sees distributed leadership as an instrument to use the available knowledge, experience and energy in a dialogic effort to innovate and learn in a VUCA world. 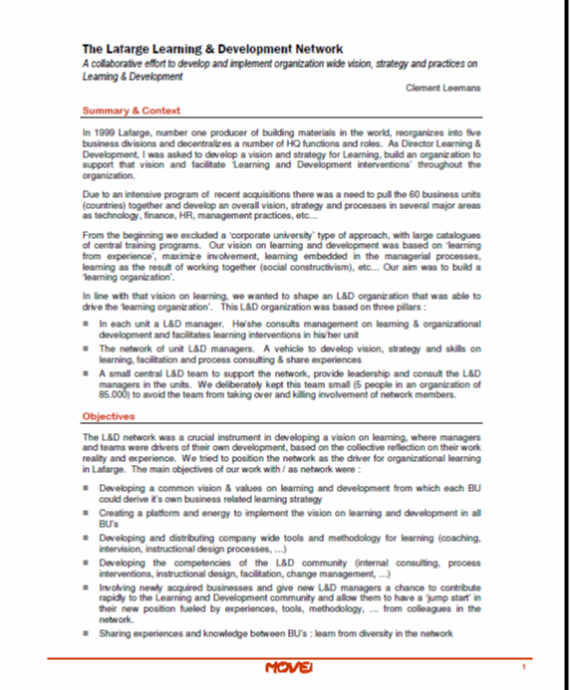 In this article Clement shows how jobcrafting can be a tool for organizational development. It is a way to help people not only create jobs that fit with their own talent and energy, but it is also a way to trigger an organizational dialogue towards shared purpose and to develop the internal customer / supplier relationships. 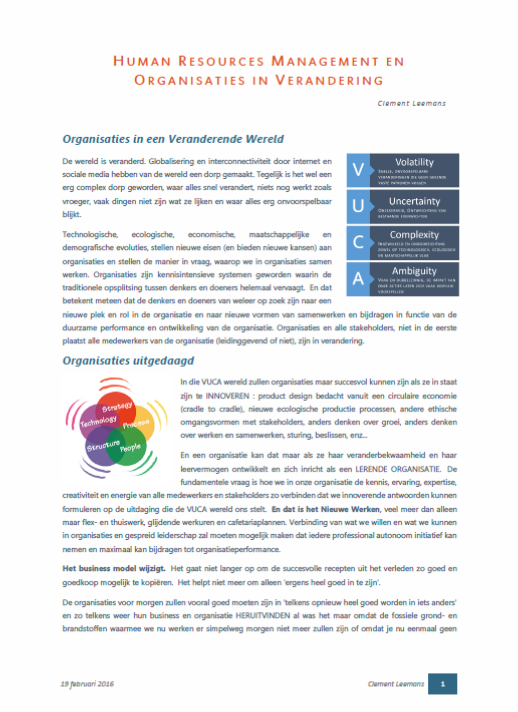 The Vuca world urges organizations to become more flexible, and as a consequence of that they need to give professioanals autonomy and power not only over the execution of their job, but also over their actions and priorities at any given moment. 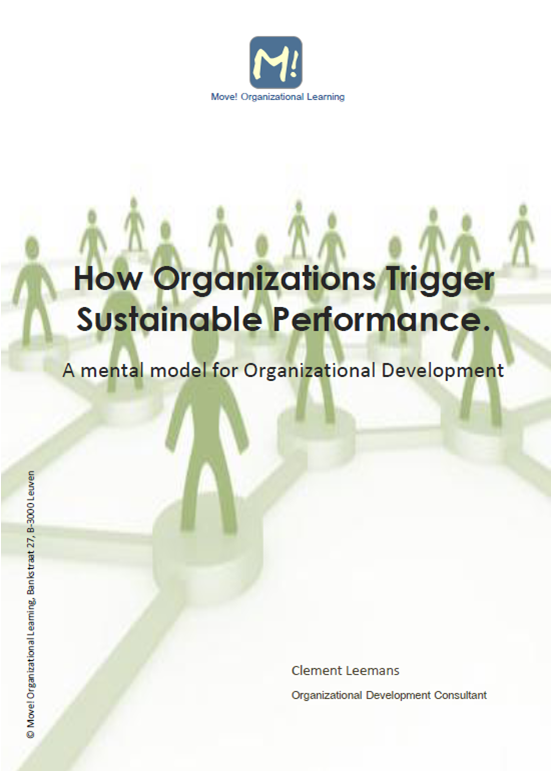 In this article (not published) Clement examines how organizational architecture (structure, culture, leadership practices, hrm, ...) can contribute to sustainable performance and development of organizations in a VUCA world. 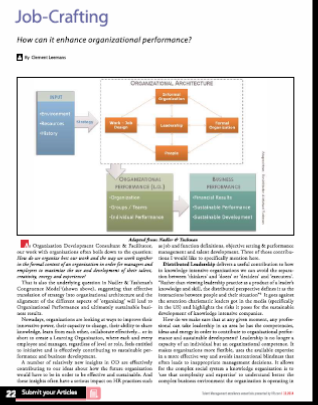 This article, a contribution to the MOPAN conference in Leuven in 2007, describes how we used in Lafarge the Networking and Community of Practice methodology to develop a vision and practice on Learning & Development based on theories of experiential and dialogic learning towards a Learning Organization. 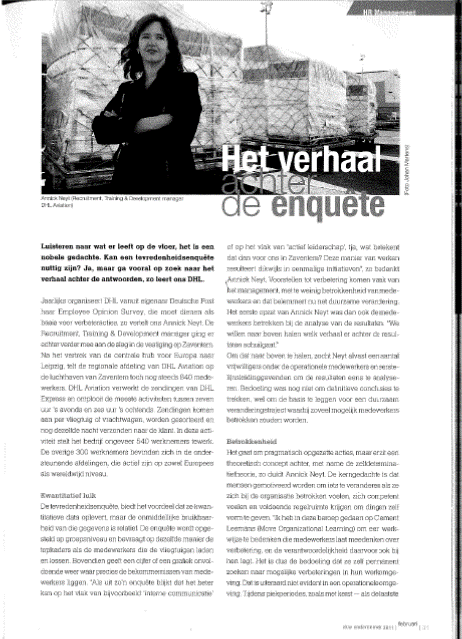 Dit is een artikel en interview met Annick Neyt, HR manager bij DHL die vertelt over het project Footprints, waarbij Move! de forumgroepen heeft begeleid om de medewerkers te helpen 'oplossingen' te bedenken voor issues die uit de Footprints enquête kwamen en die oplossing ook zelf implementeren. 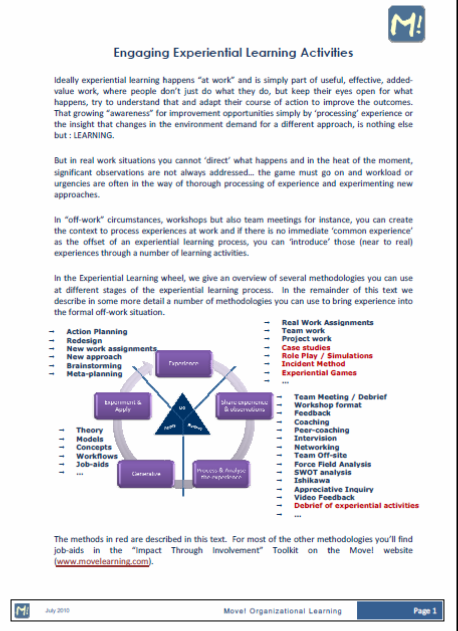 This is a short article written by Sebastiaan Duts and Clement Leemans as support materials for the workshop held at a VOV conference in 2013. 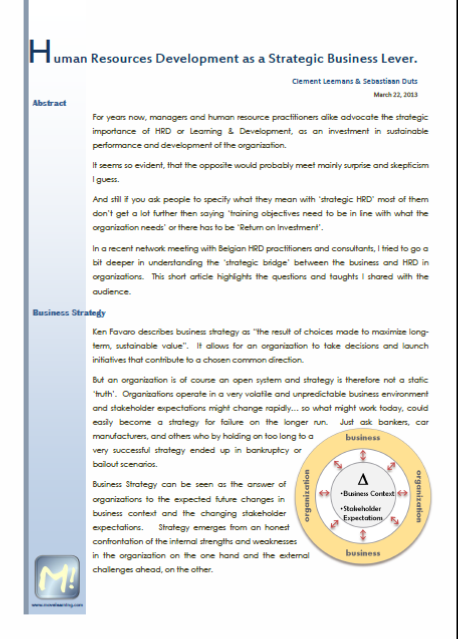 The article makes the point that HRD is not only there to 'translate' business strategy into L&D actions but can also shape and contribute to that business strategy because of their specific knowledge on organizational learning but also as 'facilitators' of an effective strategic process that involves all stakeholders effectively. In dit niet gepubliceerde artikel beschijft Clement de rol en de veranderende rol van HR in een organisatie in verandering.